If NATO threatens Russia’s territories Moscow will respond to the threat accordingly, said President Vladimir Putin. This comes after he announced Russia's strategic forces will be getting over 40 new intercontinental ballistic missiles in 2015. “If someone threatens our territories, it means that we will have to aim our armed forces accordingly at the territories from where the threat is coming. How else could it be? It is NATO that approaching our borders, it’s not like we are moving anywhere,” Putin said speaking at a joint media conference with Finland’s President Sauli Niinisto in Moscow on Tuesday. He said at the moment he sees no threat in the alliance’s activities, since the missile defense system wide deployment is a bigger threat. “I'd refrain from whipping up emotions. Of course, we will analyze everything but so far I see nothing that might prompt us to [take responsive measures]," he said. "What worries us more is the anti-missile defense system that is being deployed – that is a significant thing of strategic importance." Day later, Poland and Lithuania revealed on-going talks with Washington to host US military equipment warehouses. This prompted a harsh reaction from Moscow; Russia warned that it has no binding obligations limiting its armed forces in its Western region. On Tuesday morning Putin stated that in 2015 Russia’s strategic forces will be getting over 40 new intercontinental ballistic missiles (ICBMs). In response to all these statements, NATO Secretary General Jens Stoltenberg accused Russia of "saber-rattling." "This nuclear sabre-rattling of Russia is unjustified. It's destabilizing and it's dangerous. This is something which we are addressing, and it's also one of the reasons we are now increasing the readiness and preparedness of our forces," Stoltenberg said during a news briefing in Brussels on Tuesday. He added that NATO is making sure it "provides the terms of protection of all allies against the enemy." NATO forces are currently holding military exercises in Poland codenamed Noble Jump. Their aim, according to Stoltenberg's interview to the Polish Press Agency, is to show that the Alliance can quickly deploy its forces to any of the member countries. The drills involve about 2,000 soldiers and some 500 pieces of hardware, including tanks, jets and helicopters. The scenario is based on a hypothetical conflict with several countries taking part. It is the first official exercise of the NATO 'Spearhead' force established in Europe to counter what Alliance commanders have repeatedly dubbed ‘Russian aggression’. Washington also made a statement following Vladimir Putin's announcement about additional ICBMs. "It does concern me," State Secretary John Kerry said, answering a reporter's question at a briefing. "Nobody should hear that kind of announcement from the leader of a powerful country and not be concerned about what the implications are." 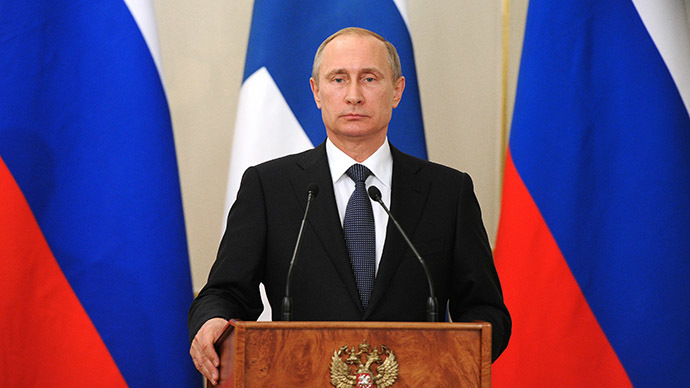 Putin made the fresh statements at a media press conference with Finland’s President Sauli Niinisto in Moscow on Tuesday evening. Besides NATO, the two leaders talked much about the on-going crisis in Ukraine and Russia’s role in its resolution. Putin said Moscow considers the Minsk ceasefire agreement to be ‘fair and balanced’ and criticized the US and EU for failing to make enough effort to pressure Kiev. “We consider [the Minsk] agreements to be fair and balanced and we are exerting the possible pressure on one of the sides of the conflict – on the unrecognized Donetsk and Lugansk republics,” Putin said The eastern Ukrainian republics are ready to hold talks on all points of the Minsk agreement, he said. He also criticized the EU and the US leaders for failing to exercise “enough pressure on Kiev authorities” in the implementation of the ceasefire agreement. There is “no alternative” to the Minsk deal and “as hard as it may be we should follow this path,” he said. The sides of the conflict “should sit down for direct talks” as there is “no other way,” he added. Niinisto, in his turn, said that Moscow and Helsinki were actively participating in the OSCE work and pledged that the work would continue. "At present, everybody should exert maximum efforts to restore peace in Ukraine and remove the current strains that are present in Russia's relations with the West," he said.